How long 'til Hendry can swing a deal for this Pedro? You're not getting it. Not any time soon, at least. Maybe next year. Maybe two years from now. Maybe when Jim Hendry steps out of the Dunkin' Donuts line. Pedro Martinez would be nice, but he is known for throwing the ball hard, not hitting it hard. 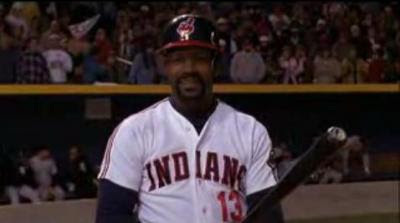 If the Cubs are to sign any Pedro, it's the guy pictured above. He could add a big, right-handed hitting bat in the middle of the line up if only until the advanced scouting reports reveal he can't hit a curveball. Oh, Jim, can you pick up some of Sammy's Flintstone Vitamins while you're out?